You might've heard by now that you're supposed to drink a glass of red wine a day. Welp, according to UC Davis professor of brewing sciences Charlie Bamforth, that's a teeth-staining load of hooey -- you should be drinking a glass of beer instead. The awesomely-titled scientist claims that the average bottle of suds is much more nutritious than a glass of wine, and he's got the facts to back it up. Cheers to your health. According to Bamforth, beer contains significant amounts of "selenium, B vitamins, phosphorus, folate and niacin", in addition to having more protein (and carbs) than wine. Also, his research (i.e. drinking lots of brews, probably -- jealous yet?) has suggested that beer may contain prebiotics, chemicals that nurture the growth of good bacteria in your digestive system. See? Everyone gets healthier! 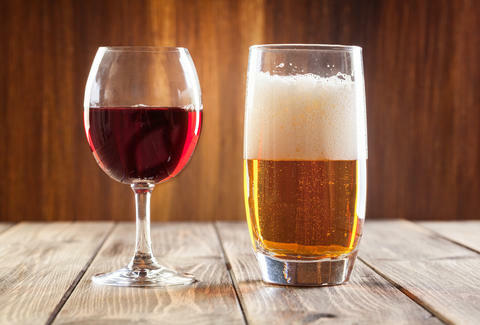 While the "liquid bread" moniker may be somewhat true (beer has plenty of carbs, and the higher the ABV of the beer, the more calorie-heavy it tends to be), he says two to three drinks per day is the ideal amount to be drinking. Thanks, Doc. Adam Lapetina is a Food/Drink staff writer for Thrillist, and plans on amending his unhealthy behavior immediately. Read his musings at @adamlapetina.